If you're a homeowner then you've likely heard the term radon thrown about. Perhaps you've heard that its dangerous but aren't quite sure why, or have heard it only occurs in basements. As the international network of leading radon professionals, National Radon Defense can help you learn everything you ought to know about this dangerous gas and dispel any misconceptions you might have. Radon is a naturally occurring gas caused by the decay of trace amounts of uranium found in the earth's crust. First discovered in 1899, it's odorless, invisible and has been classified by the EPA as a carcinogen since 1988, and is the second leading cause of lung cancer in the U.S.
Radon generally accumulates to dangerous levels inside homes, but can also be present in the soil around a house and can manage to get into building materials, public water supplies, and even outdoor air. Radon levels can fluctuate and are generally higher in the winter. Other factors can also effect radon levels like seismic activity. What are the consequences of radon exposure? Radon exposure is most closely related to lung cancer and is the #1 cause of lung cancer among non-smokers in the U.S. like Kimberly Buchmeier. 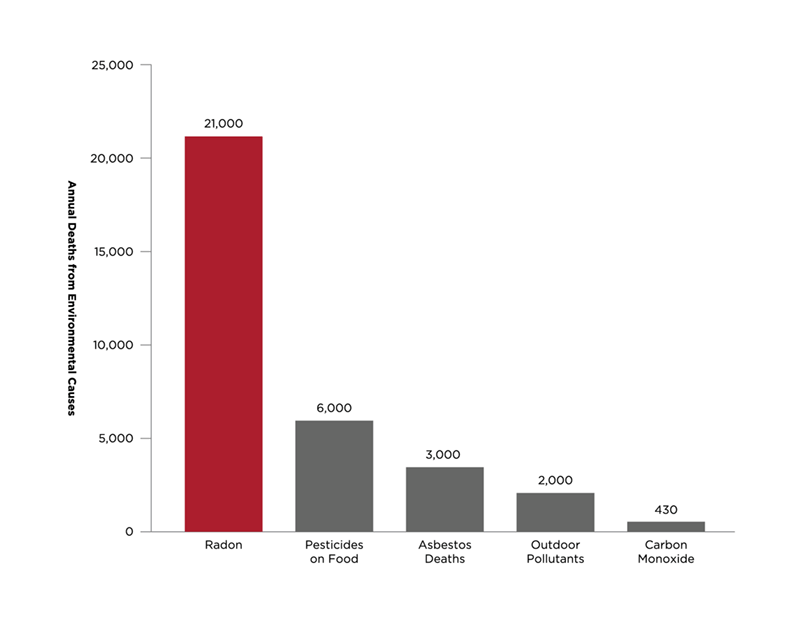 Smokers are not safe either and their risk of lung cancer goes up significantly when exposed to radon. In total roughly 20,000 Americans die each year due to radon-related lung cancer. Children are the most vulnerable but even some household pets have faced health problems due to radon exposure. There are also some indications that radon might be linked with blood cancer in women. 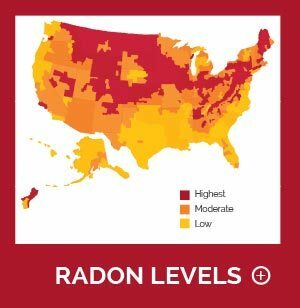 What are dangerous radon levels? While any radon exposure can be damaging, the EPA recommends that homeowners aim for radon levels below 2 picocuries per liter (2pCi/L) in order to minimize the risk. A picocurie is very small, one trillionth of a curie, and is the amount of radioactivity emitted by a single gram of radium. While less than 2 picocuries per liter (2pCi/L) is the recommended level, 4 pCi/L is the standard for indoor air where the EPA strongly recommends immediate radon mitigation. Radon can be found anywhere, but it is most common in the soil. This means that high radon levels are most common in homes with dirt crawl spaces, but even tight foundations don’t necessarily make your home safe as radon can easily slip through cracks, sump openings, floor drains, and other small gaps and holes. Radon first gathers in the basement or crawl space, but can quickly spread to other parts of the home as well. You can see how this works here. Radon can also be found in water, especially if your water comes from an underground water source. This radon often then spreads into the air, adding to your already existing radon levels. Some of the radon may stay in the water though and ingesting this water will increase your risk for internal cancers like stomach cancer. However, radon in the water causes far fewer deaths than airborne radon and is generally considered less of a risk. Trace amounts of radon can also be found in granite, which makes some homeowners nervous about their kitchen countertops. The good news is that research has demonstrated granite countertops don't tend to contain high amounts of radon. Where in the country can you find radon? Unfortunately, you can find radon everywhere within the country, even in Alaska and Hawaii. The highest levels of radon are generally found in northern regions of the country with the south averaging slightly lower levels. Minnesota, for example, has very high radon levels and the department of health recently estimated about 40% of homes may be affected. However, nowhere in the country is completely safe from the risk radon poses. Drought conditions in warmer regions can even make the problem worse. You can refer to the EPA map below for more details. Many states and countries are already taking steps to attempt to protect their residents from the dangers of radon-induced lung cancer. Some of them include: Nebraska, Oregon, South Korea, and Canada. Radon problems can't be fixed: This is simply not true. Radon mitigation techniques are extremely effective and can easily be installed quickly and cost-effectively. In fact, radon mitigation generally costs no more than any other type of home repair. Sometimes much less. Radon only affects basements: As we discussed earlier, this isn't true. Radon can be found anywhere in your home and can penetrate even the most sturdy foundation. In fact, high levels of radon have even been found in the second stories of some homes. You can learn more here. Radon only hits certain homes: House construction does affect radon levels, but no type of home is immune to radon entirely. New home, old home, drafty home, insulated home, no basement, basement, it doesn't matter. Local geology, construction materials, and methods will have an impact, but none of these factors can completely reduce the risk. In fact, energy efficient homes can actually be more vulnerable since they are more insulated and trap radon. 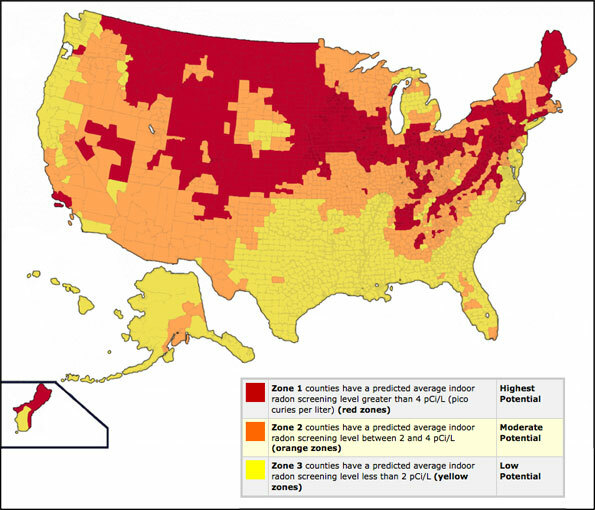 Radon isn't found in my area: As was noted in the map above, radon is found in every single U.S state. While some regions may have a lower average level, every region has been found to contain at least some radon. Even in the areas that average the lowest radon levels there are occasionally homes that buck the trend and boast radon levels far, far above the average. Radon makes my home harder to sell: As long as you have a radon mitigation system installed there is rarely any issue selling. In fact, knowing a home has already been tested and has a radon mitigation system installed can be an excellent selling point. 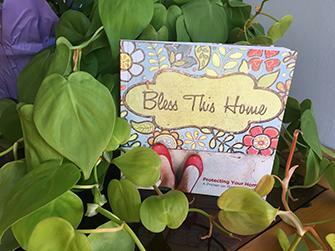 The prospective home buyer knows they have one less thing to worry about now. 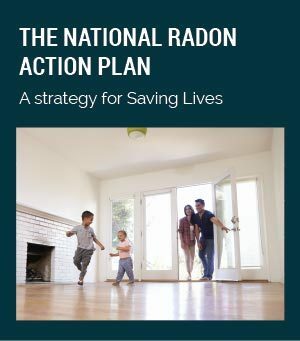 It's too late to reduce my home's radon levels: It's never too late to reduce radon levels. Radon is dangerous over long term exposure, not short term. Even if you catch the problem later, there is generally still time to mitigate the problem before its most serious consequences become evident. What can I do about radon in my home? If you think you might have radon in your home or just want to make absolutely sure you don't, then National Radon Defense can help. We are an international network of leading radon professionals and our certified radon experts throughout the country can help test your home for radon. Contact us today to find your local contractor and schedule your free estimate!